The holiday season is upon us, as are a bounty of new food shows. Today, Food Network announced a November 16 premiere date for its series Guilty Pleasures and Top 5 Restaurants. 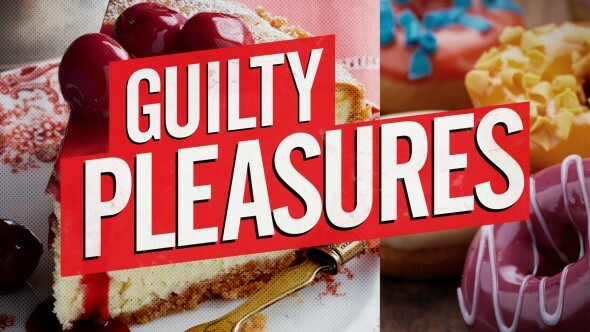 A new series, Guilty Pleasures presents the guilty food favorites of celebrities and star chefs like Bobby Flay, Richard Blais, and Duff Goldman. Returning for a second season, Top 5 Restaurants will continue its countdown of the top restaurants in the country with hosts Geoffrey Zakarian and Sunny Anderson. NEW YORK – October 27, 2015 – Get ready for the holidays by kicking off new seasons with two of your favorite series airing back-to-back holiday-themed episodes. Watch as your favorite Food Network stars and celebrities confess their Guilty Pleasures revealing some of their most gluttonous and lip-smacking secrets. Guilty Pleasures premieres on Monday, November 16th at 10pm ET/PT on Food Network, featuring Food Network stars such as Anne Burrell, Guy Fieri, Amanda Freitag, Duff Goldman, Alex Guarnaschelli, Katie Lee, Jeff Mauro and Michael Symon fessing up about their most indulgent secrets, as well as celebrities such as David Arquette, Jackée Harry, Joey Lawrence, Salt-N-Pepa, Sherri Shepherd, Carnie Wilson and more! Following Guilty Pleasures at 10:30pm ET/PT, Geoffrey Zakarian and Sunny Anderson host season two of Top 5 Restaurants, featuring countdowns of the restaurants with the best Thanksgiving dishes to the top diners, from a top 5 countdown of to-die-for fried chicken to the best ribs and top holiday foods. Whether you are looking for the best brunch destinations or one of the top romantic restaurants in the country, Top 5 Restaurants offers insights and access to restaurants that top the list! What do you think? Do you watch the Food Network? Will you be tuning in on November 16? More about: Food Network TV shows: canceled or renewed?, Guilty Pleasures, Guilty Pleasures: canceled or renewed?, Top 5 Restaurants, Top 5 Restaurants: canceled or renewed?